Bacteria detect and integrate different chemical and physical signals present in the environment that allow them to establish an appropriate adaptive responses. Research carried out in my laboratory focuses on the analysis of signaling mechanisms that modulate the expression of factors required by the pathogen Salmonella enterica to replicate during the infectious process, and also in the environment, when the bacteria is contaminating water and food. Our work includes the analysis of the signals that modulate the biological activity of specific transcription factors, and the functional characterization of these factors and the genes under their control. Our studies involve the use of genetic, biochemical and molecular biology strategies, including the use of spectroscopic techniques and structural analysis of the different factors. 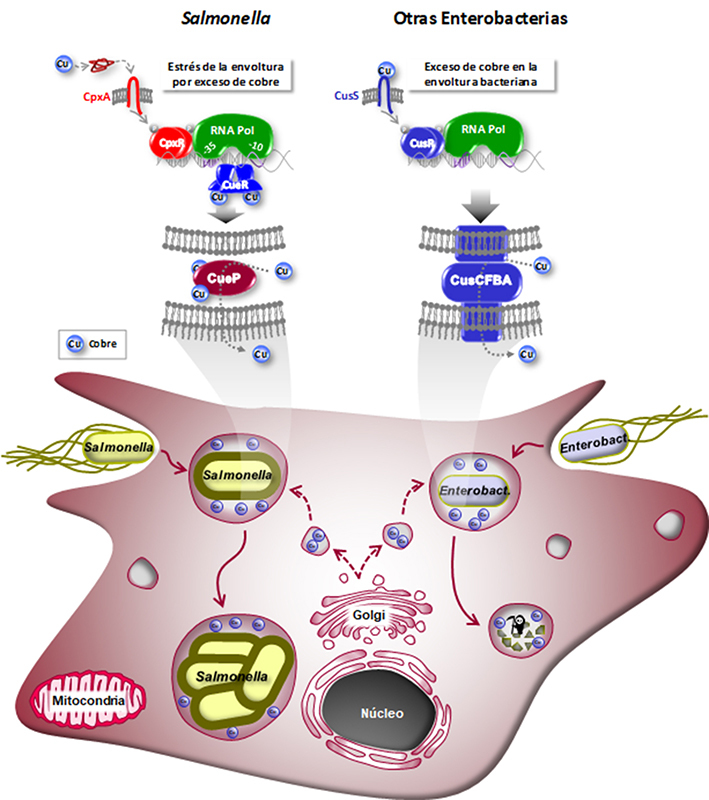 We seek to use these signaling pathways to generate useful technological tools. Part of the group is focused on the characterization of regulatory systems that recognize copper (or related ions) to control the expression of factors involved in the metal homeostasis in Salmonella. Accumulated evidence indicates that these systems are relevant for virulence of intracellular pathogens such as Mycobacterium tuberculosis and Salmonella enterica. We are currently characterizing two highly homologous sensors / transcriptional regulators from Salmonella CueR and GolS, which control the expression of resistance to copper, silver and gold. Our work involves the functional and structural analysis of the factors controlled by these regulators, in particular the products of Salmonella specific gene products, including the periplasmic copper homeostasis CueP protein (see Figure 1) and the tripartite efflux system GesABC conferring resistance to gold and xenobiotics. Our global response to copper in Salmonella allowed us to identify other factors important for the metal resistance, in particular the Cpx signal-transduction system, that controls not only the expression of genes required to restore envelope homeostasis after stress, but also the co-control of genes involved in trafficking the metal into the periplasm. Bacterial biosensors are microorganisms that have been genetically modified to couple detection of a compound to production of an easily quantifiable reporter signal. The development of these devices for the detection of heavy metals has become particularly important in recent years because they are cheap to produce, but also, because they report only the fraction of the metal that is bioavailable. In consequence, they are particularly useful for assessing environmental risk. In our laboratory we have developed the first fluorescent bacterial biosensor for the selective detection of soluble gold and other that simultaneously detects a wide range of metals, such as mercury, lead and cadmium, metals highly dangerous to humans (see Figure 2). In order to identify the regions essential for metal recognition/exclusion and the allosteric transduction of the input signal to the DNA-binding domain to activate transcription, we are performing the structural and functional characterization of the detection module of the biosensor platform, the metalloregulator GolS and its non-selective variants that sense several metal ions. Then, we will use this information to apply directed evolution on selected regions of the sensor protein to improve detection of copper, silver, mercury, zinc, lead, cadmium or cobalt. We also plan to optimize immobilization procedures and preservation of the designed whole-cell biosensors to enable the construction of measuring instruments or devices useful in the evaluation of drinking water or industrial effluents. 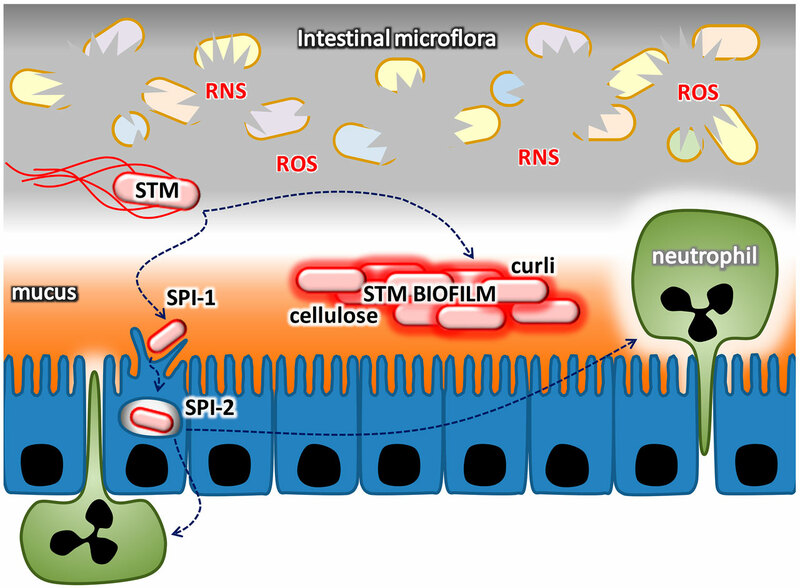 Bacterial control of the transition between motile and sessile lifestyle is not only essential to survive in hostile environments but also to establish numerous infections. We are analyzing the role of specific Salmonella transcription factors that control the passage from the planktonic to sessile stage but that are also require for virulence. We are investigating the signals that modulate the activity of these factors, their controlled targets, their functional interrelationship, and the role of each of them in the decision making between planktonic and sessile life style. The results of these studies will include strategies developed by Salmonella to adapt to changes in the environment that occur primarily during the infectious process (see Figure 3). In addition, these studies will assist in understanding the mechanisms by which a microbe can reprogram its lifestyle, altering the expression of genes in response to environmental or intracellular signals. It is expected that our findings will provide valuable information as a model for gene-regulation to other bacterial species and generate potential technological tools for the design of new antimicrobial therapies. Banda MM, López C, Manzo R, Rico-Pérez G, García P, Rosales-Reyes R, De la Cruz MA, Soncini FC, García-Del Portillo F and Bustamante VH (2018) HilD and PhoP independently regulate the expression of grhD1, a novel gene required for Salmonella Typhimurium invasion of host cells. Scientific Reports 8(1):4841. 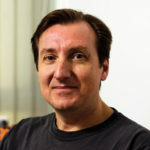 Dr. Francisco García del Portillo, del Departamento de Biología Celular y Molecular de Patógenos Bacterianos Intracelulares, Centro Nacional de Biotecnología, CNB, CSIC, España. PICT-2015-2056. Agencia Nacional de Promoción Científica y Tecnológica (ANPCyT). "Control de la formación de biopelículas y la virulencia en Salmonella". PICT-2015-2339. Agencia Nacional de Promoción Científica y Tecnológica (ANPCyT). "Generación de sensores biológicos sensibles y selectivos para evaluar contaminación de las aguas por metales pesados". PICT-2013-1513. Agencia Nacional de Promoción Científica y Tecnológica (ANPCyT). "Homeostasis de cobre y su rol en la patogénesis de Salmonella". PICT-2012-1496. Agencia Nacional de Promoción Científica y Tecnológica (ANPCyT). "Control de la virulencia y el establecimiento de vida sésil por reguladores transcripcionales específicos de Salmonella". PIP 112-201101-00328. Consejo Nacional de Investigaciones Científicas y Técnicas. “Resistencia bacteriana a iones metálicos monovalentes: claves para el diseño racional de biosensores selectivos”. BIO461. 2016-2019. Universidad Nacional de Rosario. "Análisis molecular y funcional de la resistencia a cobre y su relevancia para la patogénesis de Salmonella enterica". Fig. 2. 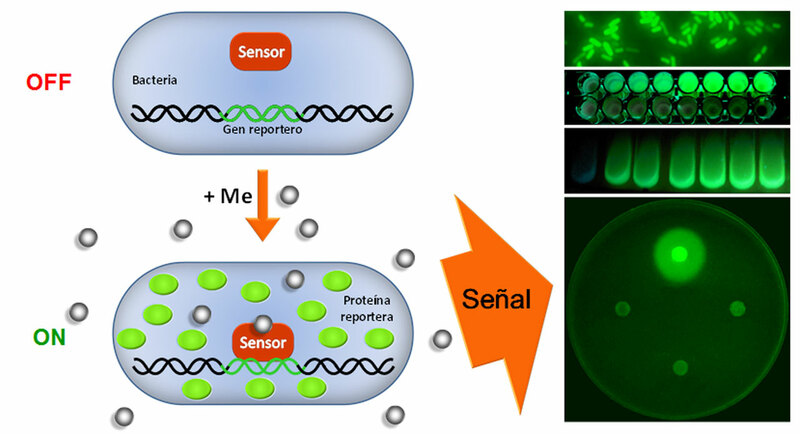 In the biosensor, the genetically modified sensor recognizes the metal (Me) and induces the expression of a fluorescent protein that produces the detected signal. Fig. 3. Salmonella causes intestinal inflammation during gastroenteritis affecting the local microbiota. The production of extracellular cellulose and curli favors the pathogen’s survival in this environment.